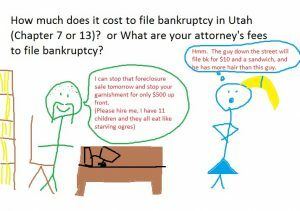 How much does it cost to file bankruptcy in Utah (Chapter 7 or 13)? 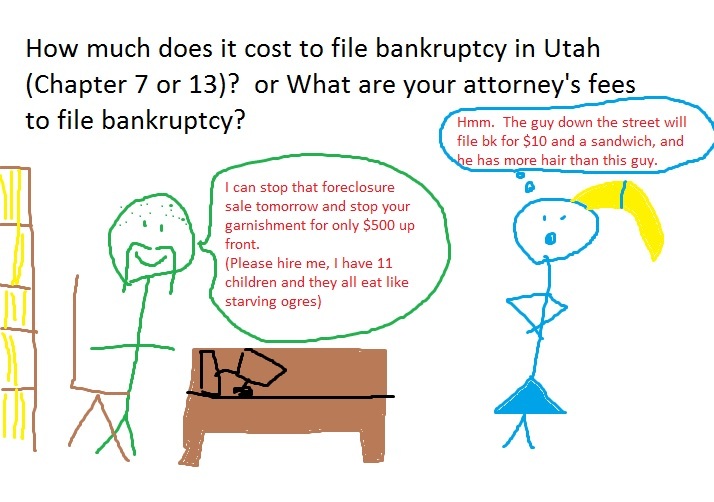 or What are your attorney’s fees to file bankruptcy? I hate this question, and to be honest, I’ve put off writing this blog post for over a year. First off, I will really try to price match, so don’t automatically call the lowest bidder. Short Answer: $500 up front to file a chapter 13 or $1,000 up front for a chapter 7. Chapter 7: total attorney’s fees are $1,000 and total court filing fees $335 (which you pay directly to the court). Chapter 13: total attorney’s fees range from $3,500 to $4,000 (set by court) and total court filing fees $310 (which you pay directly to the court). In a Chapter 13, you also make one monthly payment to the bk trustee to cover your car payments, back taxes, mortgage arrears, etc. My remaining fees come out of this monthly payment. Every attorney in the state is awarded the same fees in a chapter 13. So you really won’t save any money by shopping around. Some attorneys will charge $0 down for a chapter 13, but I’ve found that if my clients don’t have a little skin in the game (down payment), then they never take the bankruptcy seriously). 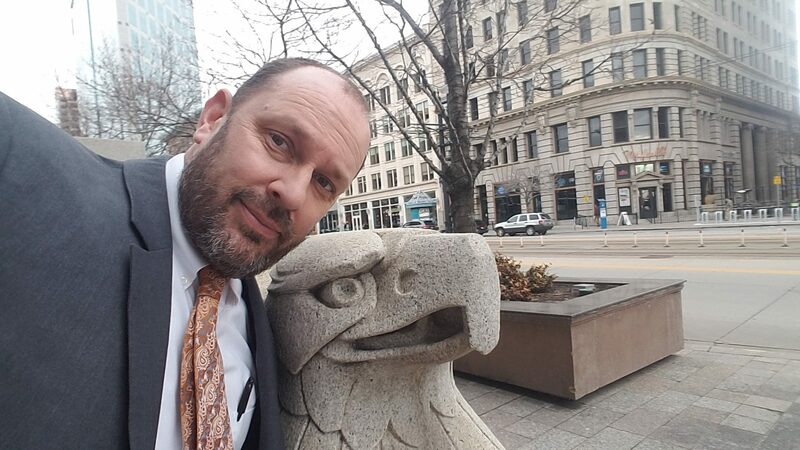 So the total would be $2,900 if I could bill out my time, but if I tried to do that, I would lose you to all of the other flat fee attorneys filing cases for much, much cheaper. . I hate the whole charging fees thing because I really did get into this to help people, but it turns out that I need to charge something to keep the lights on. That’s why my fees are right in the middle for bankruptcy firms: I’m not the cheapest, and I’m definitely not the most expensive). This entry was posted in Utah Bankruptcy on September 19, 2017 by robertspaynelaw.